What is a New Jersey Sublease Agreement? New Jersey Sublease Agreement: What Is It? A sublease is an agreement between two tenants: a Sublessor and a Sublessee. The Sublessor is defined as the original tenant of a rental who has a valid lease with the landlord, while the Sublessee is the incoming tenant who will rent the property in place of the Sublessor. With the landlord’s written permission, the Sublessee will rent the space for a predetermined period of time, or until the original lease ends. While the Sublessee is renting the space, the Sublessor’s name will remain on the original lease agreement with the landlord. Should anything unfortunate happen during the sublease agreement, such as property damage or nonpayment of rent, the Sublessor will be held responsible (in most jurisdictions). New Jersey Tenant Laws directs tenants to follow the terms of their lease. 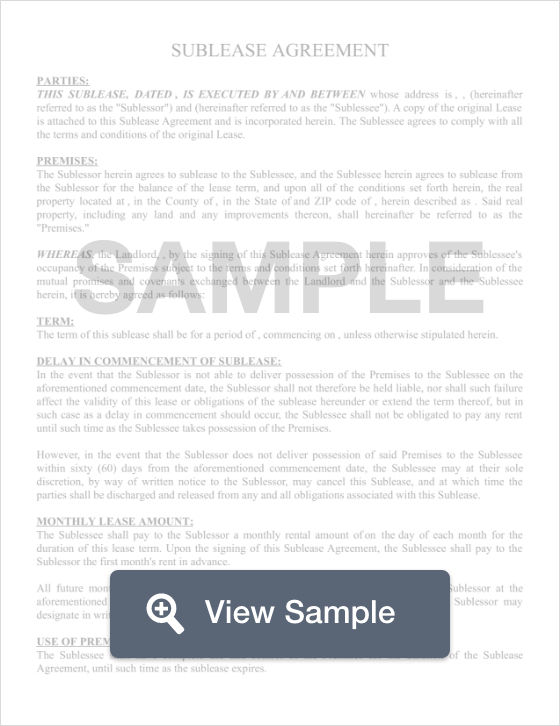 If their lease requires prior approval or vetting by the landlord before moving forward with a sublease agreement, then the tenant must follow these prompts.